Expect cutting-edge design, innovative spaces and stylish accommodations at this iconic airport hotel. 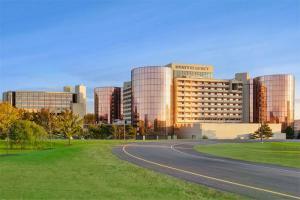 Adjacent to the convention center, the hotel is the ideal choice for event attendees. 1,095 suites and rooms feature ergonomical workstations, sitting areas, iHome/iPod docking, 65-inch flat screens, Hyatt Grand Bed®, free Wi-Fi and ADA/accessible features. Upgrade to Regency Club status for exclusive access to the Lounge for complimentary continental breakfast, snacks, hor d’oeuvres, and beverages all day, as well as a private concierge. Spend your downtime at the 24-hour gym, or at the restaurant and bar and lounge. The hotel offers a free airport shuttle, as well as conveniences such as a sundry store, and express check-in options. Pets are welcomed guests as well. Two miles from the O'Hare Int'l Airport, connected to the Donald E. Stephens Convention Center. The hotel is approximately 15 miles from downtown Chicago.